Ephraim unpacked his crates of medical texts, literature and books of faith, and commissioned a signboard. What finer place to be than Leavenworth, Kansas, the gateway to the West! As promised, there was certainly need for physicians here. He soon met the very best people of the city. Attorneys, bankers, manufacturers and merchants were among these civic-minded citizens, aspiring, sincere, self-made men. 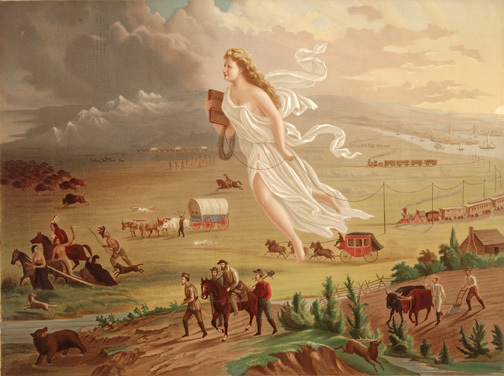 He shared their belief in American as the land of opportunity, and caught their enthusiasm for America’s duty to civilize this great continent — its manifest destiny. Freed by his dear mother’s death to return to America and Christianity, Ephraim leaves behind Europe and his daughter for the second time. Full of optimism, in Chapter 21, America Regained, 1867-69, he sets up medical practice in a booming western town. But before long he encounters the darker side of the great American dream.